Juxtaposing the neighbouring buildings in the Liberty Village area, which were once cut off from the rest of the city of Toronto, Hotel X Toronto is the new sought-after boutique kid on the block that is making waves as a new kind of luxury experience in a city that welcomes more than 40 million tourists each year. 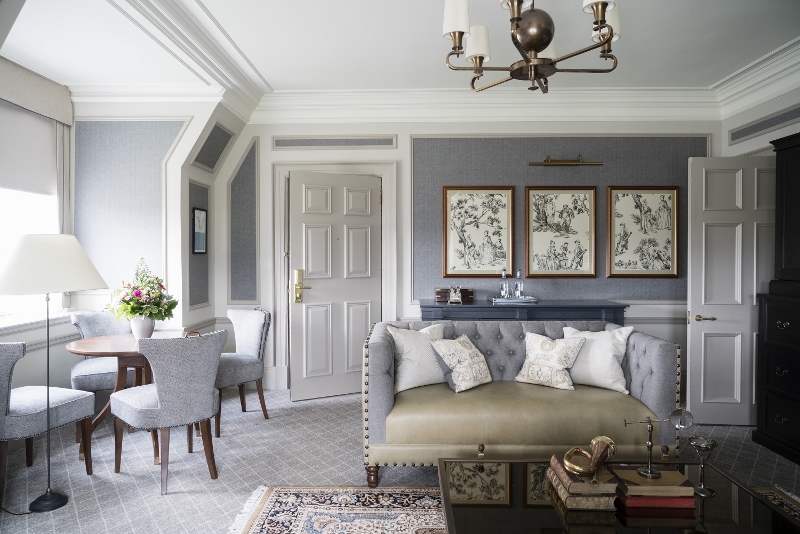 Imagined and designed by Stephen B. Jacobs Group and Andi Pepper Interiors Design, the hotel opened in March 2018 with the aim of creating an extravagant and contemporary hotel with dramatic flourishes. Using its unparalleled location and striking views as a design and architectural reference, X certainly does now mark the spot near Liberty Village, which becomes directly apparent when checking in. Upon arrival, guests are immediately welcomed into the hotel’s towering size combined with unassuming elegance. On the exterior shell, reflected beams of light hit the glass building, which creates a colourful display in an otherwise grey, and somewhat sombre business district. Despite the hotel, with its state-of-the-art technology and business facilities, appropriately keeping in line with the suit-and-tie scene that surrounds, personality pops out in unassuming moments. 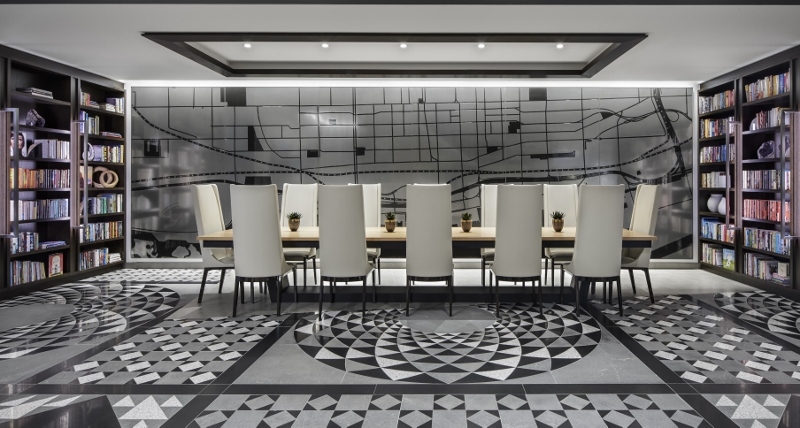 In the entrance, for example, monochrome, geometric flooring that has been sourced from all corners of the earth is the perfect metaphor to represent the city as a place where people meet from around the world. The hand-cut marble reception desk sits in front of a living wall that covers the height and width of the lobby and creates an instant sense of peace that is far removed from the metropolis outside. A grand staircase on the right leads to a glass bridge that overlooks the spacious and minimalist area and offers a platform where guests can enjoy the lobby area from a different perspective, such as an up-close look at the detailed circular patterned chandeliers. 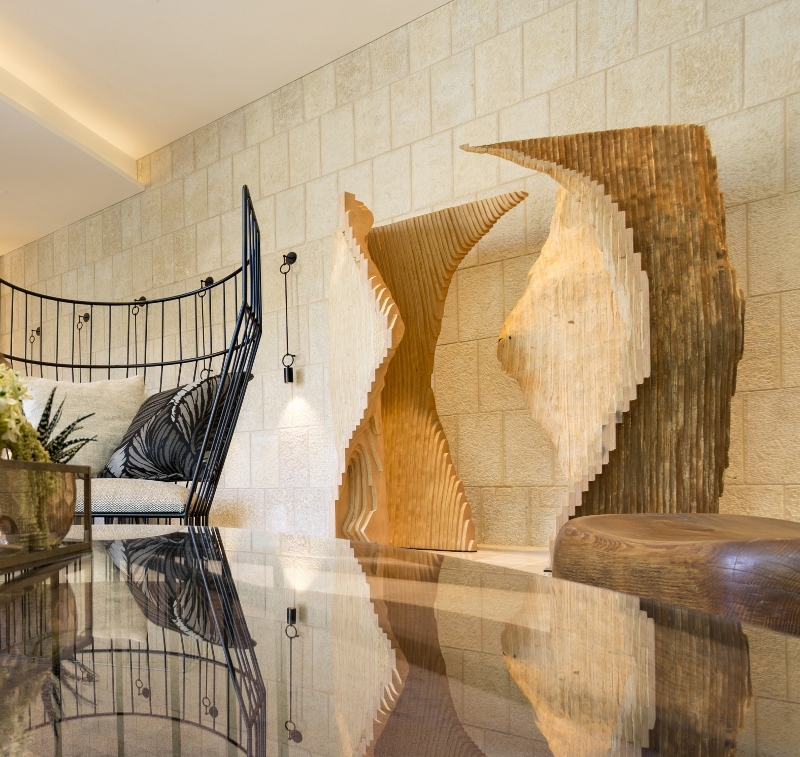 Art is a prominent theme captured throughout the hotel. A gallery on the ground floor is devoted to photographer Neil Dankoff, whose landscape pieces famously led him to become a staple on the art and photography scene in Toronto. 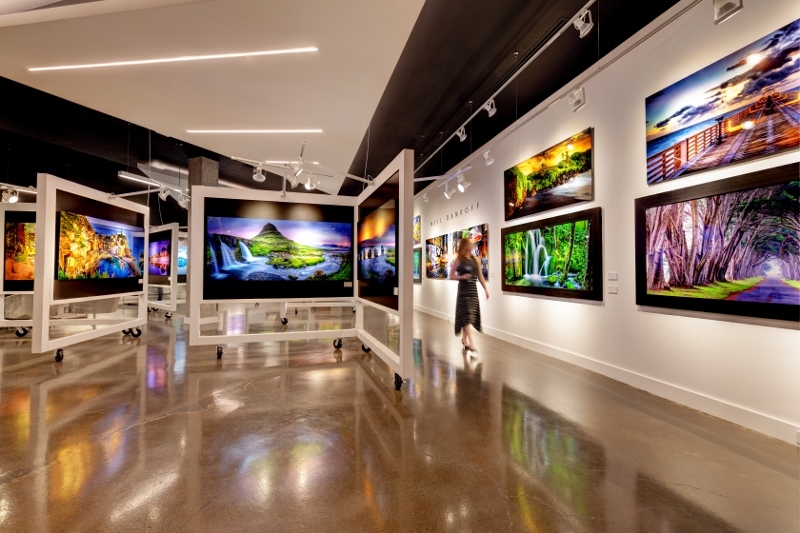 His ‘Kandy Gallery’ commission with Hotel X, which sees his signature images that depict worldwide adventure hung on the walls, turned out to be the largest fine art photography transaction in Canadian history. Dankoff spent almost three years travelling the globe to capture more than 800 landscape photographs that were purposefully commissioned for use within the hotel. Hung in such a way so that guests notice an eye-catching canvas of natural beauty around every corner, Dankoff’s work is quite literally written on the walls. Cleverly, his work from the gallery filter into the guestrooms and suites, resulting in a further reclined backdrop. The guestrooms and suites that offer a lake view incorporate water within the pieces, whereas the rooms that face the city skyline contain more physical features such as woodlands and rock formations. The gallery is a strong design unique selling point that positions Hotel X in a league of its own, but the adjacent library, complete with an oversized statement floor-to-ceiling bookcase, is another design centrepoint. Set in a monochrome setting, which is filtered through from the lobby area, the library’s matte-silver backdrop creates a sense of place with a carved map of the famous downtown area embossed in black paint. The space, which is open to both guests and the public, has been sensitively designed to offer guests a tranquil working environment. The ambiance within the ground floor corridors changes from the other public areas as the walls transform from a soft cream to white light glass panels. Placed side by side, these LED flashes create a chequered wall that both reinforces the Hotel X brand while also boosts new energy in an area that is lacking natural light. 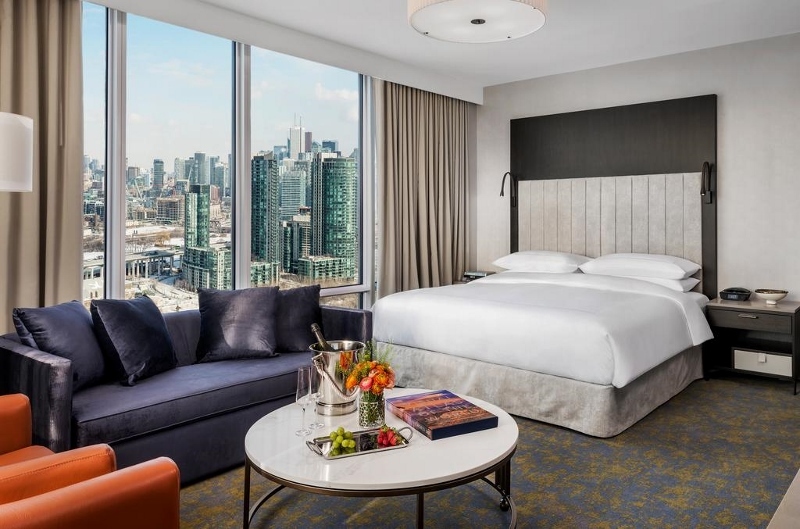 Taking full advantage of the complete Toronto skyline, each guestroom and suite features floor-to-ceiling windows. 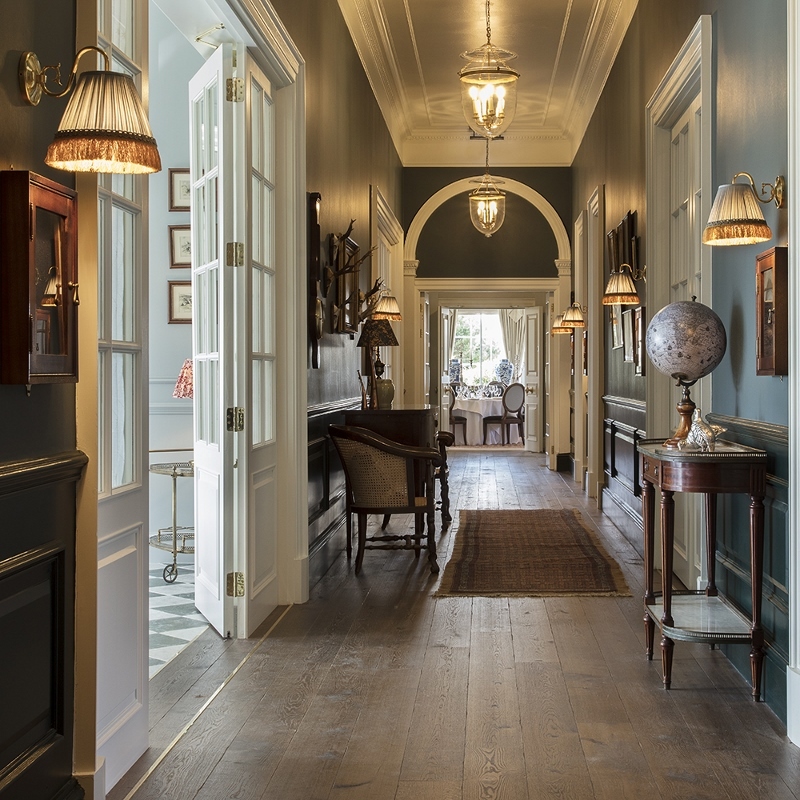 The spacious living quarters in the suites, which are filled with natural light, blend blues, greys and blacks into dark-oak fittings. Bright, block colour in the furniture infuses the right balance of personality. The sliding doors between the living areas and the bedroom keep the space open at all times and flooded with natural light that flows, like the carpet, throughout each room. The large beds with cream headboards create another layer of calmness that is occasionally interrupted by loud accents in the furniture. New Fort Hall is a unique area of the hotel, not only for its visual appeal but also for its way of retelling history. The glass conservatory has been built on several 18th century military forts. Instead of demolishing the ruins completely, the design team incorporated them to create an eye-catching venue space. The glass floor quite literally allows visitors of the hotel to look down on the original floors of the military barracks. The room itself provides a beautifully simplistic contrast between the old beneath and the modern metropolis that can be captured through its glass. The hotel supports multi-level sports halls that have been positioned in such a way to overlook some of the city’s largest sport stadiums including BMO field. Adding to this motivation is the personalised EGE Atelier carpet, which divides each area with the lyrics to the song ‘imagine’ by John Lennon. No stay at Hotel X is complete without a visit to the 28th floor, which is where the vision for Liberty Village’s new era of luxury was conceived from. 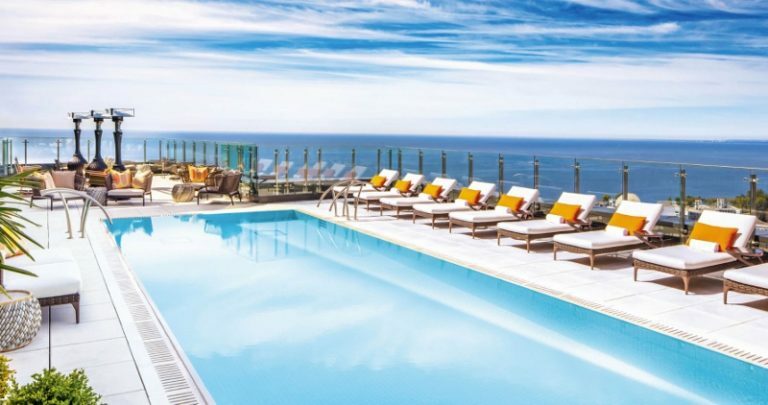 Both the rooftop Falcon SkyBar and heated swimming pool on the top floor offer guests the ability to experience the city from a VIP-perched level. The iconic three-level bar balances relaxation, style and drama. The suede purple wingback chairs sit alongside other gold and grey suede seating that tributes the colours of the sunset that reflects off Lake Ontario. The 404-key Hotel X is more than just another urban hotel with a view to pop up. 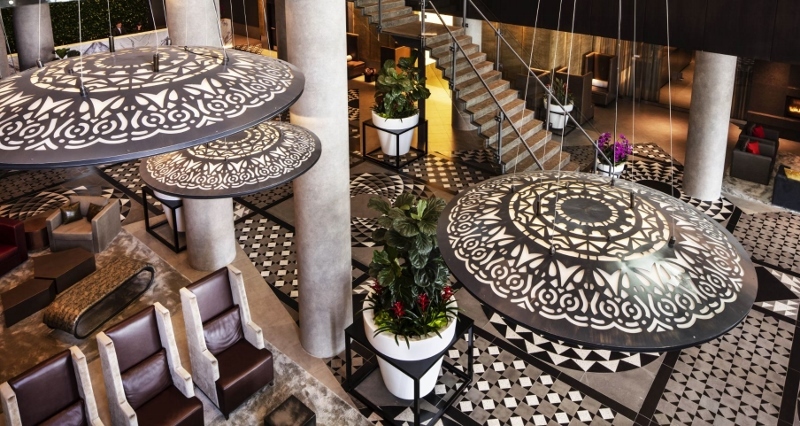 Unlike other hotels in the area, Hotel X took on mission impossible to help transform the largely undiscovered area of Liberty Village into a luxury tourist hotspot that was also equipped to take bleisure travel to new heights. Through design lenses, it has completed that mission in style and has become a go-to destination in itself, further complementing the city skyline with effortless charm. 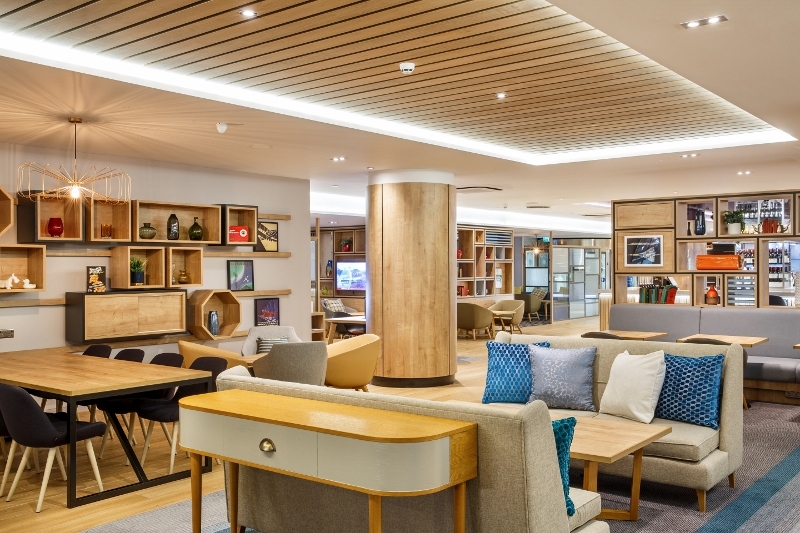 The days of the The Holiday Inn brand being perceived as a cheap and rather basic night away are long gone, as IHG has unveiled a new design era in the brand’s history which begins on the fringes of London Heathrow airport. 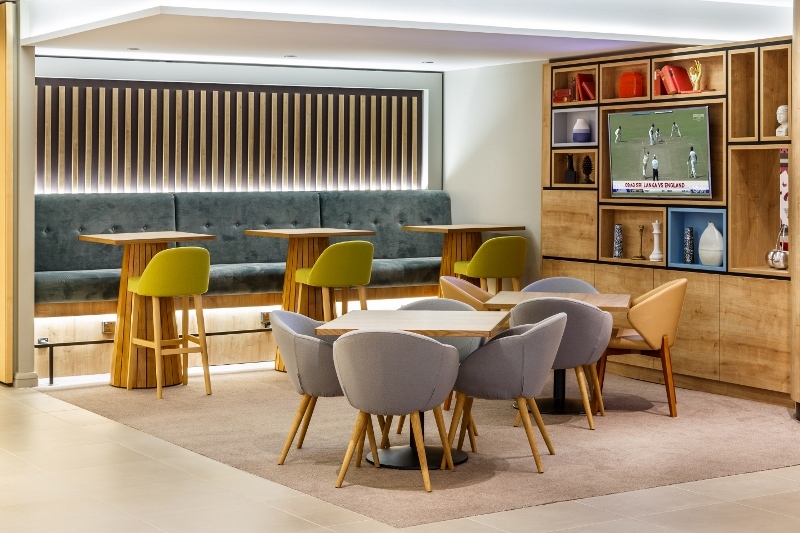 Complete with a open lobby, flexible work stations and dynamic interiors throughout with a strong focus on contemporary art outside the frame, The Holiday Inn London – Heathrow M4, Jct.4 has pulled off a significant refurbishment to the public spaces, revolutionising the guest experience from check in through to check out. 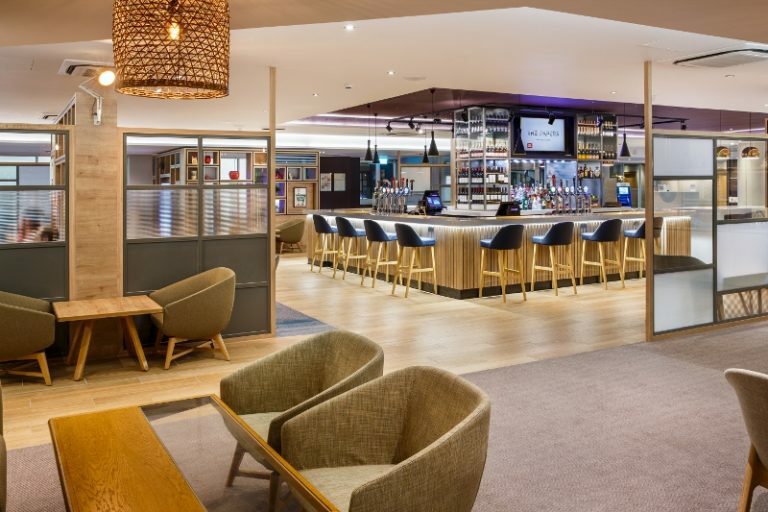 The refurbishment followed the news that LGH Hotels Management Ltd, which owns and manages a portfolio of Holiday Inn and Crowne Plaza hotels across the UK, announced a multi-million-pound refurbishment plan across their properties, starting with the Holiday Inn London – Heathrow M4, Jct.4. The new open lobby transforms how guests eat, drink, work, meet and socialise by providing one cohesive space to fit their individual lifestyles. The redesigned space merges the reception, lounge, bar and restaurant to create one relaxed and multi-faceted area with no barriers, so that guests can blend work and leisure instinctively, which has already received rave reviews from guests and visitors. Omar Nicholls, Development Director for LGH Hotels Management Ltd, was tasked to oversee and execute the refurbishment plans for the hotel and has worked closely with external design agency Design Coalition to achieve the new Holiday Inn open lobby concept.“Our main goal with the open lobby design was to create a space that feels familiar, like an extension of home, and has a logical flow so guests can truly relax and utilise each corner in a way that makes sense to them and accommodates all of their work and relaxation needs,” he explains. Designed to reflect a laid-back living room, guests find comfort in the furniture that feature appropriately placed charging units. The new dining area in the lobby is now a flexible and informal space with a range of high and low tables and booths to suit everyone, be it a working lunch or relaxed group meal. 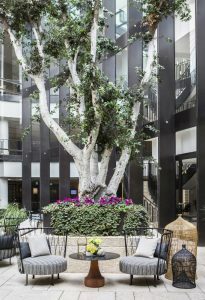 The open lobby concept is unique to The Holiday Inn brand and will be extended to properties across Europe to become a brand-defining feature. 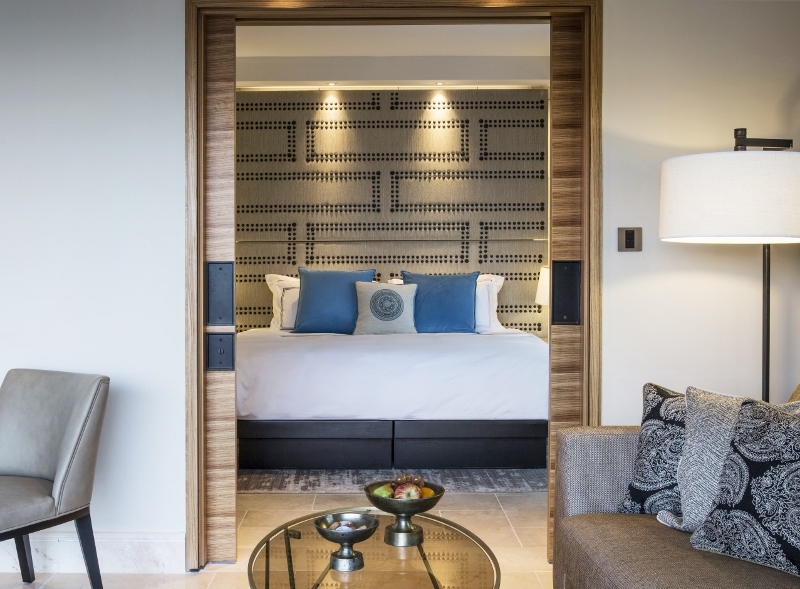 Following Hotel Designs exclusive discussion with the design firm’s senior designer Constantina Tsoutsikou, HBA London has completed the interiors of The Orient Jerusalem by Isrotel Exclusive Collection. Beginning with the cherished Song of Jerusalem ‘A timeless love song to the city’, the hotel’s interiors were inspired by the extraordinary layers of history, culture and artistry as well as the sheer beauty of the indigenous stone which bathes the city in a golden hue. The Orient sits at the entrance to Jerusalem’s historically rich and increasingly cosmopolitan German Colony district. 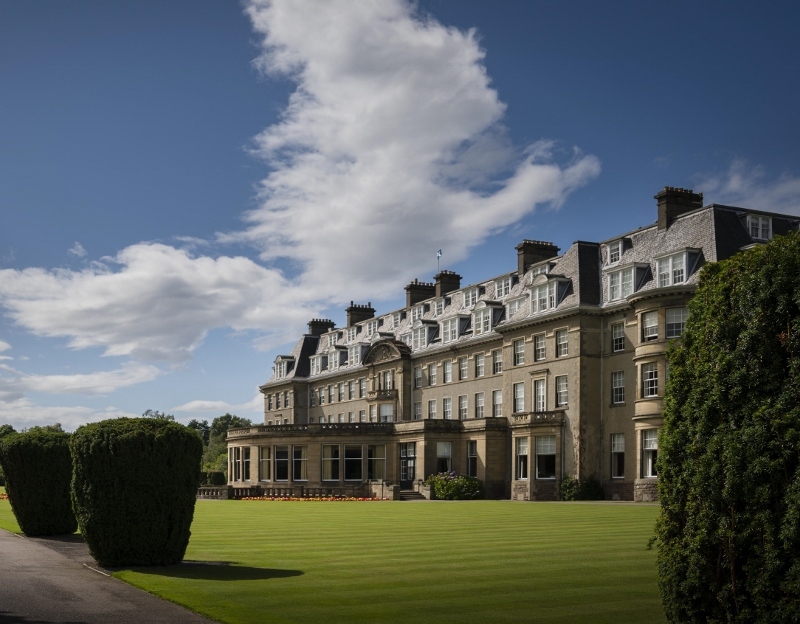 It combines two exquisite 19th century Templar houses, which have been restored and reinvented as a collection of more than 200 luxury guestrooms, with a modern nine-storey building crowned by an elegant rooftop pool and bar. “We were particularly blessed with this project because we not only had the city to draw on, but the influences of the German Colony’s Swabian architecture,” said Inge Moore, the former Principal of HBA London. “Jerusalem is an amazing city for a designer to work in. Everything is embraced by the golden tint of the stone, interspersed with the green of foliage and plants and with bright punches of colour in the fruits, markets, textiles and ancient decoration. Over the centuries, Jerusalem has been a melting pot of peoples, each bringing their stories and crafts and leaving a great legacy of artisanal resourcefulness. Artwork plays a key part throughout the hotel. Art curator Sharon Toval has emphasised Isrotel’s belief in the essential role that art has in creating spaces full of powerful associations and beauty. Like the interior design, the inspiration for the artwork was Jerusalem’s history and the land, reimagined into contemporary expression. 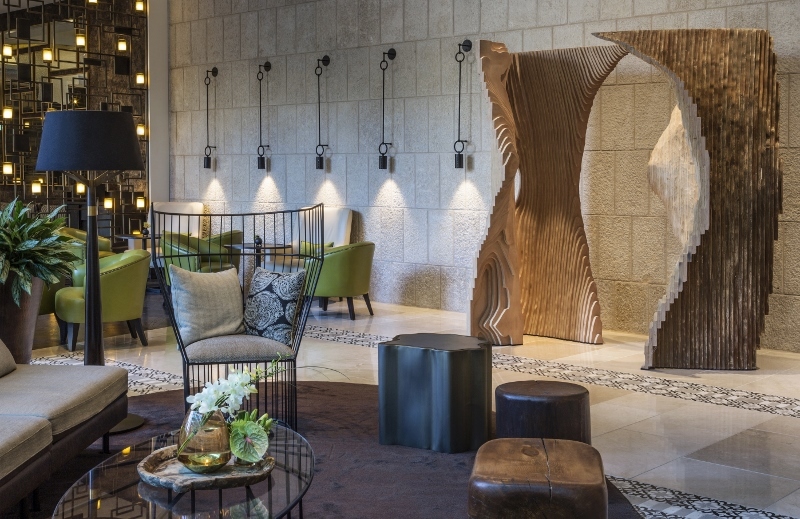 The result is a collection of sculptures, watercolours, prints and etchings by acclaimed and emerging Israeli artists as well as by the students of Bezalel Academy of Arts and Design who undertook a year-long project to each create a sculpture relating to the city and the hotel. The journey begins within a grand atrium of glass and Jerusalem stone. The high-glazed ceiling welcomes in an abundance of natural light, that is complimented by thoughtfully positioned lighting from Northern Lights. The public area is dressed with gently gathered drapery that lends elegance to the space while also shields guests from the midday sun while softening the acoustics. Inspiration for the illuminated mosaic tiles was taken from encaustic tiles found in the Templar buildings. 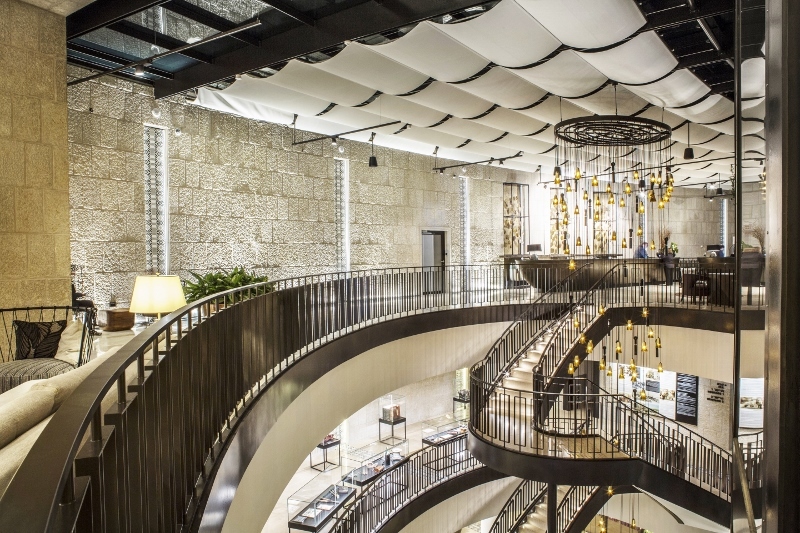 The reception desk is of bronze and a chandelier with hand-blown local glass cascades through the central stairwell, suspended above a reflection pool two floors below, to captivate guests on arrival. The grand lounge bar is designed to be the beating heart of the hotel and has, as such, become a favourite hotspot for hotel’s residents and locals alike. Located just off the entrance lobby, it is an atmospheric double-height space that is a symphony of reflective and textural surfaces. The bar itself is clad in a richly grained green marble, the pattern of which has been translated into the wall covering. A composition of framed verre églomisé mirrors, together with antiqued mirror to the back of the bar, play with movement and reflections within the space. 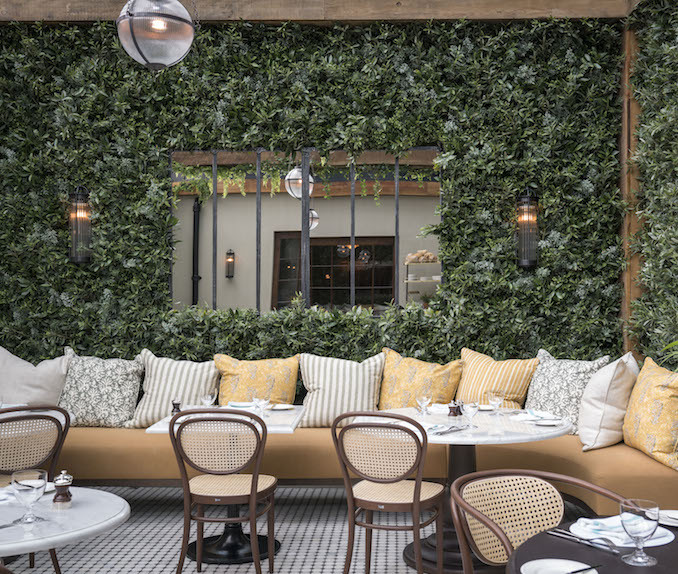 Plush banquet seating, elegant leather covered armchairs and local lace chandeliers soften the geometric pattering and beaten metal features, while screens on each side of the bar recall the many layered views to be found in the streets of Jerusalem. Through soaring arched windows, guests can access cosy balconies overlooking the delightful outdoor courtyard below. Jerusalem stone walls carry through from the exterior facade to meet silvered mirror clad walls and glass screens etched with the pattern of the old encaustic tiles, which together poses a play of reflection, transparency and opacity that is the experience of Jerusalem. Olive wood adds to the energy of the space and forms a striking assembly of suspended panels with acoustic insulation which manage the volume of sound in this imposing room. The dining room flows out into the courtyard – an al fresco area designed to accommodate guests throughout day and evening. From here, guests can take in the architecture of both the new and old hotel buildings. 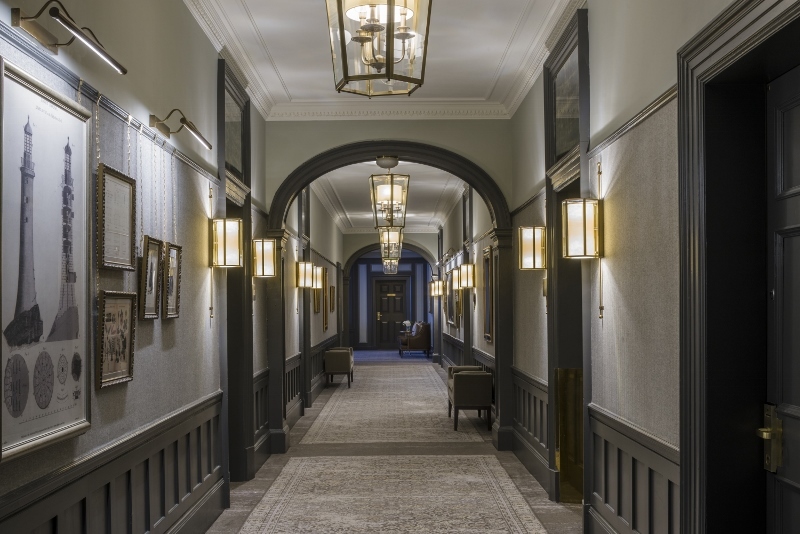 The guestrooms in the Templar buildings are each unique in their architectural form and detailing, representing, in effect, 39 individual projects for the designers. Within the idiosyncratic spaces, the guestrooms combine luxury with elements of local handicraft to bring the authenticity of these heritage buildings to life. The blue and ivory palette is both beautiful and meaningful. These are the colours of the national flag and the “tekhelet” blue recalls the biblical blue of Judaism which, when combined with ivory tones, captures the spirit of Jerusalem. Encaustic floor tiles that flow from the bedroom into the bathrooms are similar to those found in the original buildings during restoration. 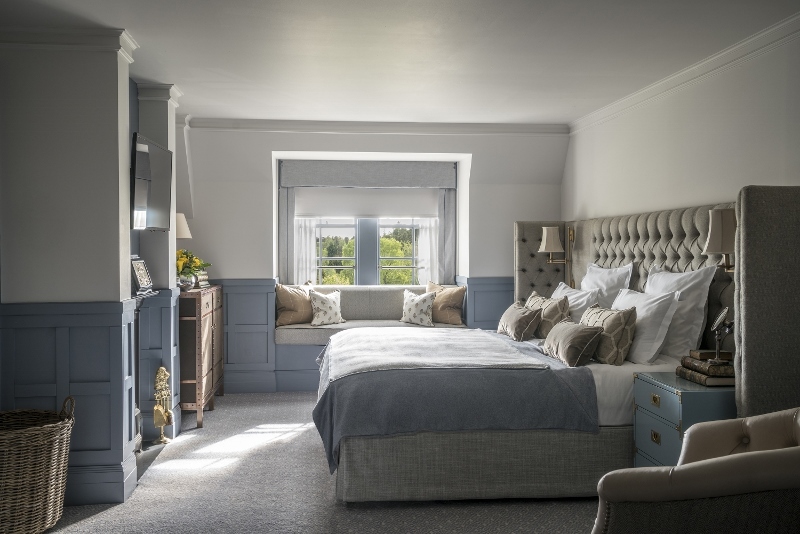 Crafted wrought iron bed frames are focal points in the bedrooms with a blue leather chaise longue at the foot of each bed adding a touch of opulence. Locally crafted, antique-style mother-of-pearl inlaid cabinetry enhances the residential feel whilst the neutral palette, tiling and use of stone emphasise the simple beauty of the old architecture. Many of the bathrooms feature a large window through which light streams in, illuminating the fittings that include aged metal basins and mixer taps, as well as a traditional free-standing copper-clad tub by Cifal. The 205 guestrooms and suites in the new building reference local heritage and craftsmanship but within the context of a contemporary background. Studded headboards hint at the old doors of the city, lamps are artisanal, and table tops are of olive wood. The naturally warm tones of the textural woven fabrics of the drapery and upholstery are instrumental in creating a sense of tranquil luxury. Sliding panels between bedroom and bathroom open up to allow guests to appreciate the balance of natural stone, olive wood, wrought iron and plush woven fabrics across the entire space. The 24 suites bring even further materiality and detailing as well as the addition of a spacious sitting room with deep, comfortable sofas and, in some cases, a dining area or a terrace allowing outdoor lounging and dining. The 118 sq metre Presidential Suite enjoys a deep, fully glazed dual aspect outdoor terrace. Indoor and out, guests have uninterrupted views across the panorama of Jerusalem. Light, water and stone work in perfect harmony. 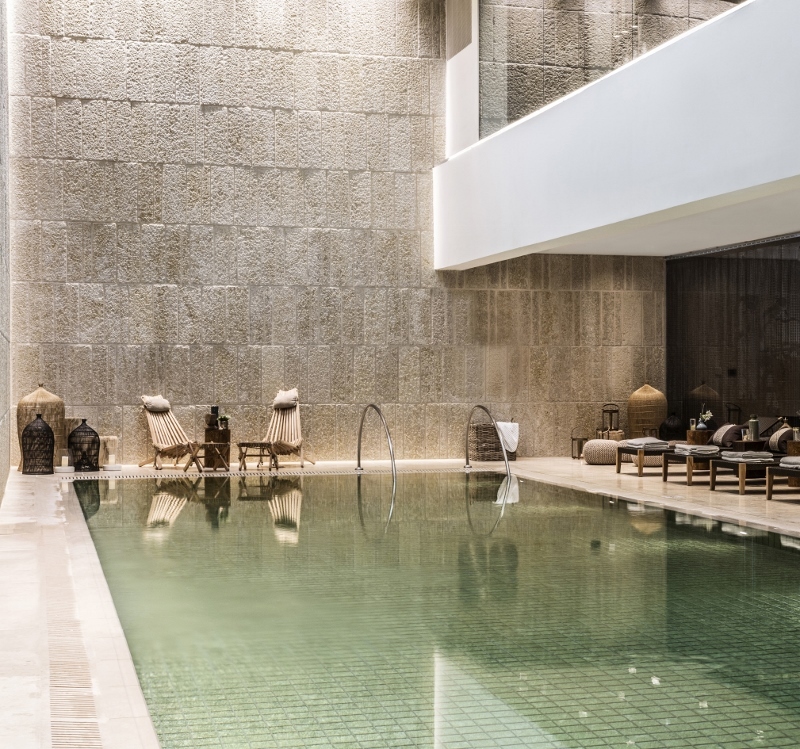 It is as if the cavernous space around the pool has trapped the very source of “Jerusalem Gold” between its faceted ceiling and Jerusalem stone walls. The grand design statements of the rough-hewn lava stone feature wall with its cascading waterfall and the golden crystalline structure of the ceiling capture elements of the volcanic. Shimmering bronze chain-link is suspended along a glazed wall to obscure the gym. In contrast to this grandeur, the seven treatment rooms, including a couple’s treatment suite, are simple and calming. They combine warm timber floors with a stone envelope and a light projection wall to create spaces where the focus is all on guest wellbeing. The rooftop pool and bar tops out the new building at 10th level. Guests can take full advantage of the spectacular 360 degree views over the old city walls whilst lounging in cabanas and pergolas by the poolside, or sipping cocktails in the glamourous, electric blue and white tiled bar, which has been decked out with artisan ceramic tables discovered by the designers in a local market. The Orient opens not as a contemporary hotel, but more a timeless masterpiece that has been sensitively designed in every detail to reflect the charm and character of the historic city it surrounds.